The Meaco DD8L Dehumidifier is ideal for use as a garage dehumidifier or boat dehumidifier and can work unattended in low temperatures. Its desiccant technology allows it to be smaller, lighter and quieter than a refrigerant model and with continuous drainage and auto-restart it is well suited for use in cold places that you are unable to visit on a daily basis. The Meaco DD8L Dehumidifier is the second desiccant dehumidifier in the Meaco range. It uses the water adsorption properties of a desiccant material to trap water and dispenses with the need for a refrigeration process. It is a little more powerful than the DD122FW-Mk4 and suitable, therefore for a larger area. Although still more costly to run than a refrigerant dehumidifier this type of unit is no longer more costly to buy and some of its advantages may outweigh the additional energy bills. Because the Meaco DD8L Dehumidifier does not condense moisture to collect it from the air it does not suffer from the problem of ice formation that degrades the performance of refrigerant dehumidifiers at temperatures below 20°C. For operation in much cooler temperatures a refrigerant dehumidifier requires an active defrosting system which adds to the purchase cost. Desiccant dehumidifiers are now available for use in the home at prices which make them extremely competitive with such models. The absence of a compressor, for the refrigeration system, eliminates one of the sources of noise in a dehumidifier and makes these units quieter, not to mention lighter, than a refrigerant model. These benefits are keenly sought by dehumidifier users and the extra electricity cost will be a price worth paying for many. For use in the normal living areas of the home the choice between the two types of dehumidifier will come down to individual priorities but for use in cool areas, such as an unheated cellar or a garage a dehumidifier such as the DD8L offers clear advantages. The Meaco DD8L Dehumidifier draws in air from the room and passes it across a desiccant wheel. This wheel is made up of the desiccant applied to another material in a succession of alternately flat and corrugated sheets. This design maximises the surface area of the desiccant and provides a large number of channels though which the incoming air may pass. This is important because it is the surface of the desiccant material that absorbs the water. The wheel rotates slowly and during each complete rotation a portion of the wheel is passing through a warm air flow. The heat energy in the air flow drives the water from the desiccant and allows it to capture more moisture during the subsequent cycle. The water removal power of the desiccant is thus continually "reactivated" and the desiccant does not lose its capacity to capture more water. This differs from the refrigerant process used in the typical home dehumidifier which condenses water vapour on to a cold coil. The disadvantage of the refrigerant process is that the formation of ice on the coil degrades and eventually stops the process. A dehumidifier is then inactive until the ice is melted. Dehumidifiers with a passive defrost system rely on stopping the condenser and running the fan to pass air from the room over the coil to defrost it. The lower the ambient temperature the longer this takes and this type of dehumidifier is relatively ineffective at low temperature. A small number of refrigerant home dehumidifiers have an active defrost system which redirects warm air over the coil and defrosts it much more quickly. This type of dehumidifier is effective at low temperature but tends to be at a higher price point than units with a passive defrost system. A desiccant dehumidifier is not affected by temperature in this way and does not need any form of defrost system; it will be effective down to 1°C. Desiccant models such as the Meaco DD8L Dehumidifier are less expensive than refrigerant models with hot gas defrost and are rapidly becoming the preferred type for use in low temperature applications. The Meaco DD8L Dehumidifier will extract 8 Litres of water per day from the air at 20°C and 60% relative humidity. This rate is almost impossible to compare with those quoted for refrigerant dehumidifiers but the difference should not be taken to imply that this unit is less powerful than a refrigerant dehumidifier (with passive defrosting) rated for 20 Litres per day. If you were able to compare the amount of water collected by the two machines at normal room temperatures it will be very similar, while at low temperatures the Meaco DD8L Dehumidifier will be far superior. The extraction rate of the DD8L will fall at lower temperatures but this is simply because there is less water to collect; cool air "holds" less moisture than warm air. It is, however, at these temperatures that condensation is at its worst and the ability of the DD8L to lower relative humidity to 50% in such conditions is a huge advantage. Because it does not need the heavy compressor essential to a refrigerant unit the Meaco DD8L Dehumidifier is an exceptionally light weight appliance. At just 6.4Kg the DD8L is easily portable using the carrying handle and does not need the castor wheels usually found on refrigerant models. One of the applications for which desiccant dehumidifiers are favoured is keeping a boat dry inside. In a boat castors would be a definite disadvantage. The DD8L is also a compact dehumidifier and measures just 35.1 x 18.8 x 50.0cm. A small foot-print and a slim design are always desirable in a dehumidifier but for a compact apartment, a jam-packed garage and almost any boat this is a much valued feature. A second benefit of not having a compressor is that the DD8L is quieter than a refrigerant dehumidifier. We would not wish to overstate this advantage. All dehumidifiers make a noise and the principal source of that noise is the fan, used to draw in and blow out the air. You will find this dehumidifier relatively quieter than a refrigerant unit but the noise is still apparent, especially in a mode using the highest fan speed. In any application it is a chore to have to empty the water collection container a couple of times every day. In a garage it is less convenient still and in a boat, well nigh impossible. Fortunately the Meaco DD8L Dehumidifier is equipped for continuous drainage. An outlet port is built into the casing to which a drainage hose may be connected. Provided that a drain is close by, and at a level below the outlet port, the water will run away as it is collected. For further convenience, especially when you are unable to get to your dehumidifier on a daily basis, the DD8L incorporates an auto-restart function which will switch the unit back on following an interruption in the power supply. 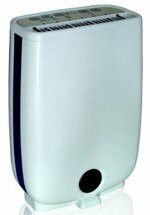 Desiccant dehumidifiers do have other characteristics which may or may not suit your individual circumstances. A refrigerant dehumidifier will expel air that is a couple of degrees warmer than the air it draws in. In a desiccant dehumidifier this heating effect is much larger, maybe 10 to 12°C. This is because warm air is used to reactivate the desiccant wheel and that air is passed back into the room. This heating effect is an advantage when you are drying wet clothes in the laundry mode which can be selected on the Meaco DD8L Dehumidifier. It is also an advantage if you are using the unit in a cold area as raising the temperature reduces relative humidity and so reduces the risk of condensation. In cold weather the heating effect is a bonus in the home but if you are using the dehumidifier on warm summer days it is unlikely to be welcomed. A second disadvantage of a desiccant dehumidifier is its higher energy consumption in comparison with a refrigerant unit. The choice you make between the two types will be decided by which of the advantages offered by each type of dehumidifier you value most highly but for cold areas it is difficult to beat the Meaco DD8L Dehumidifier. Consumer reactions are very positive for this unit. Those who have used it in their homes have usally bought it for its low temperature operating capability and for the heating effect. They have all been pleased to find that this dehumidifier does all that the manufacturer claims. Others have used it in garages, conservatories, holiday homes and boats and have been equally pleased with the results. There have been almost no complaints about reliability and where negative comments have been made they have been about additional features that could have been provided, and about noise level. In our view this dehumidifier is entirely suitable for the purposes for which it is advertised. It is not the best choice for a home that is kept warm most of the time because in these conditions a refrigerant dehumidifier will be equally effective and will cost less to run. For a cold area in a house, a conservatory perhaps, or as a garage dehumidifier or a boat dehumidifier this unit is effective and reliable. We note the comments about noise level. In our view desiccant units are "over-sold" as quiet dehumidifiers when they are merely quieter dehumidifiers. Compressor noise is secondary to noise made by a fan, and all desiccant dehumidifiers have a fan. Given that buyers have a realistic expectation of the noise level they are unlikely to be disappointed in the performance of this unit and we recommend the Meaco DD8L confidently to our visitors.